"Tamawa", a brand launched by Belgian designers known for the manufacturing of billiard balls, makes freely replaceable fashion accessories mimicking colorful billiard balls. In order to fully enjoy the freedom of accessories, Tamawa came up with a unique design; for example, a ring is partly made of shape memory alloy, and when it's cooled briefly in freezers or with ice, the ring will open up like a letter C, and this allows the users to exchange the balls. Normally, accessories and jewelries are often referred to in the context of "brand" or "rare material", but these old-fashioned values have nothing to do with "Tamawa". 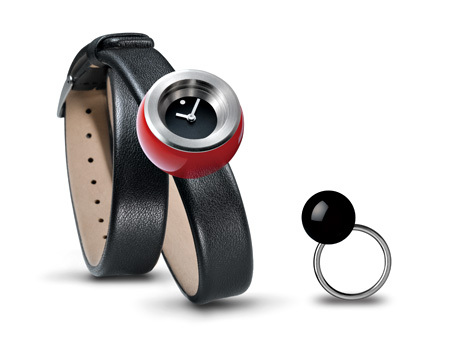 The fun of relating materials with forms, an active game-like feature to "combine", the uniqueness as an accessory, and the stylish feel; it gives off a unique presence, even from the product design point of view that is rarely seen in conventional accessories and jewelries. The refined packaging is unified in black, and one can feel joy just by looking at the neatly arranged colorful balls. It is a collection of gems with high design quality.